Look what showed up at my door yesterday! Flowers from my friend, Tawni! Tawni always goes way above and beyond in spoiling me with surprises, and she's really really good at sending unexpected flowers! This is just what I needed to get me excited about decorating the house for the holidays! Thanks, Tawni !!!! I'm hoping to tackle the holiday decorating next week after I finish a project I'm working on for a client .... invitations for a law firm celebrating their 10th anniversary. The event is formal and being held at a ritzy restaurant. It's a challenging project for me, as it's difficult to make "elegant and formal" without looking like a wedding invitation ... BUT it's coming along! Over the past couple of days, I've been sharing details with you from our weSTAMP SU Demonstrator Meeting. Another aspect to our meetings is a Show & Tell table where members can bring things they've made to share with the rest of the group. The samples brought to the meeting were too numerous to post, but wanted to share one project in particular that was quite a conversation piece! This advent calendar was made by Pam Wood based on Beate John's tutorial HERE. Pam's Advent Calendar uses Stampin' Up! 's Dashing DP, and Wilton metal tins to hold a treat for each day. Pam thought it would be a great idea to have this as an advent calendar for herself where her husband could fill each tin with jewelry! LOL! I also promised the weSTAMP ladies that I would post the recipe to the dessert I brought that evening. It is a dessert that I make often that was given to me by my sister-in-law, Barb. Bake the brownie mix as directed on package in a 9" x 13" pan. Cool. Beat cream cheese and powdered sugar for 2 min. Fold in 1/2 of the cool whip. Spread on brownies. Chill 1 hr. Combine milk and pudding. Refrigerate 5 min. Spread on top of cream cheese layer. Refrigerate 10 min. Spread remaining cool whip on top of pudding layer. Drizzle caramel topping and sprinkle pecans. This is a Christmas present Lorri Heiling and I created and gave to our SU downline and weSTAMP members Tuesday night. The mini loaf pan contains a loaf of fresh baked Pumpkin Bread, and the criss cross card has the recipe for it inside. This gift was inspired by Chat Wszelaki's Fall Gift HERE. 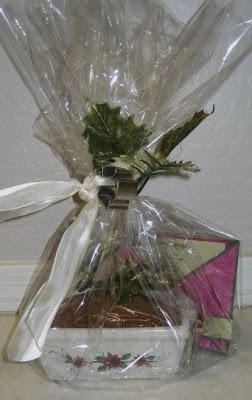 The cellophane is secured by holiday ribbon with garland and a cookie cutter. Note: Tutorial for Criss Cross Card by Beate Johns found HERE. The recipe for the Pumpkin Bread was printed from the computer. Sift the dry ingredients together and add to the rest of the mixture. Make into 3 loaves, or 7 small loaves. Bake 1 hr. at 350 degrees. Last month, my SU Sideline and dear friend, Lorri Heiling, and I joined our creative teams for monthly Stampin' Up! Demonstrator meetings. We fondly named our group weSTAMP in conjunction with my blog name. The weSTAMP SU Demonstrator Group is a wonderful group of women that all share a passion for stamping, papercrafting, and Stampin' Up! products. 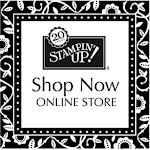 If you are interested in becoming a Stampin' Up! Demonstrator which includes the perk of swapping with this fabulous group of women, please email me! nrileycm@cox.net. Lorri Heiling's swap card uses the NEW Time Well Spent stamp set and Cutie Pie DP. Don't you just love the way she snipped the Wild Wasabi CS to make the grass?! Leah Sinatra's beautiful card uses the NEW Time Well Spent stamp set with Fall Flowers DP. Gorgeous colors, huh?! ... Soft Sky, Really Rust, and Old Olive. Adriana Gray's SUPER CUTE swap card uses Bugs & Kisses Stamp Set with Cutie Pie DP. Pam Wood used Illuminations stamp set with lots of BLING ... silver embossing, Dazzling Diamonds, and Stickles. So elegant! Anne Fundner used Baroque Motifs stamp set to create this beauty with the colors of Always Artichoke, Bravo Burgundy, and Kraft. Ginny Schembri used the oh-so-elegant Le Jardin DP and Heartfelt Thanks stamp set to create this unique fold to her card. Jessica Blair brought in the holiday cheer with her Christmas card using Dashing DP, Perfect Presentation stamp set (Level Two Hostess), and a dry embossed Cuttlebug strip. This was my swap card using Big Bold Birthday stamp set and Creative License Simply Scrappin' Kit (Level One Hostess). My swap card was inspired by Carol Frerich's card found at the bottom of her post HERE (Stamp Like Crazy). It's hard to see in the photo, but the Pumpkin Pie gift is popped up on dimensionals. Note: Ribbon is in two pieces. The piece that wraps around the card base is adhered behind the main image with Sticky Strip. Leah Sinatra won the door prize at last month's meeting, therefore being crowned the provider of this month's door prize. Leah altered these super cute chipboard letters with Fall Flowers DP that spell the word "STAMP". Funny story .... the winner of this chipboard letter collection was Pam Wood ... the first three letters that Pam pulled out of the gift bag were "P", "A", and "M". We all had such a puzzled look on our faces wondering how Leah knew Pam would be the winner of the door prize to have spelled her name!!!! Looking forward to our next weSTAMP meeting and swap in January, girls! Can't WAIT !!!! Today's Featured Stamper (FS42) on SCS is Beverly, TexasGrammy. I didn't have to look in Beverly's gallery for long before I knew exactly which card I wanted to case. THIS CARD of Beverly's caught my eye when it was posted last week. Things I changed from Beverly's card: a) I used Real Red instead of Bravo Burgundy, b) I used Holiday Harmony DP for the background strips instead of Always Artichoke Prints DP, c) I used Season of Joy stamp set instead of Peaceful Wishes, d) I added X-mas Red Stickles in the center of the small flowers for a little Christmas bling. This would be a great "mass assembly Christmas Card" ... super easy! Love the Real Red & Always Artichoke combo! The swirl stamp from the Season of Joy stamp set is stamped with Versamark on the Real Red card base. The swirl stamp from Season of Joy on the main image panel is stamped in Always Artichoke for the center image, then stamped off for the other two images. Some of the small poinsettia flowers are also stamped off with Real Red ink. My dear friend, Lorri Heiling ... Confessions of a Stamping Addict ... sent this beautiful card to my family this week, acknowledging the loss of our Uncle Rene. Lorri wasted no time getting ink on this new stamp set, Time Well Spent. This stamp set was sent to all Stampin' Up! Demonstrators as a gift of thanks from Stampin' Up! .... yep, FREE! (another SU Demo PERK!) Time Well Spent will be offered as a Level 3 Hostess set in the new catalog & idea book that comes out in January. Melissa Russell was the winner of my last blog candy here. I was completely surprised when I received this package of goodies from her this week! She had read in one of my tags that I love licorice and sent me a box full of it, along with this beautiful handstamped card! The dry embossed large flower on Melissa's card was done using the Cuttlebug .... so cute! What a FUN surprise! ... so not necessary, but glad you did, Melissa! Thank you!!!! Hope you all have a wonderful Thanksgiving holiday! We just returned from my sister-in-law, Norene's house (aka Martha Stewart ... lol !!!). She fed 32 of us with all the traditional Thanksgiving dishes. Norene is so talented when it comes to entertaining ... she is amazingly organized, has a beautiful home for a large crowd, and is an excellent cook! So much, in fact, she was on the local news last night! Channel 5 in Phoenix did a segment in Norene's kitchen about preparing the Thanksgiving meal. They couldn't have chosen a better person for the segment, that's for sure! Thank you, Norene ... you spoil us! I received this tag from Wendy Bond, joelysmom on SCS. You're all going to think I'm the biggest Christmas Scrooge after you read my answers. Honestly, I used to LOVE and enjoy Christmas when the kids were younger. I just don't buy into the retail hype of the holiday, especially when there are so many expenses to raising teenagers. I get completely stressed out this time of year with so much to do, and have to ask myself "why am I doing this?". We will definitely be simplifying our Christmas this year. Welcome to the Christmas edition of getting to know your friends. Here's what you're supposed to do, and try not to be a SCROOGE!!! Change all the answers so that they apply to you. 1. Wrapping paper or gift bags? Wrapping Paper, for sure! It's so much more fun to unwrap a gift by tearing the paper! 2. Real tree or artificial? Artificial. Have you ever heard them say, "Phoenix is a DRY heat"? 3. When do you put up the tree? When I feel like it! Probably within the next couple of weeks. 5. Do you like eggnog? Yes. 6. Favorite gift received as a child? My parents gave me my own phone and phone line, a big deal back in the late 70's, early 80's! My Dad got tired of the home line being unavailable to him! 10. Worst Christmas Gift you ever received? A back massager from DH ... since then, I've received USEFUL gifts from him! 11. Mail or email Christmas cards? Traditionally, hand stamped Christmas cards with family photo and letter. This year, I may not get my personal Christmas cards done as I'm swamped with making cards for clients. 13. When do you start shopping for Christmas? Unlike Dottie K who is completely DONE with her Christmas shopping and Wendy who is ALMOST DONE, I may start mine the second week of December. 15. Favorite thing to eat at Christmas? My favorites are the holiday appetizers like cheese balls, crackers, hors de oeuvres, etc. 17. Favorite Christmas song? White Christmas, Jingle Bells, ... enjoy all of them! 19. Can you name all of Santa's reindeer? Dasher, Dancer, Prancer, Vixen, Comet, Cupid, Donner, Blitzen...and Rudolph of course. What she said!!!! 21. Open the presents Christmas Eve or morning? We open gifts from family on Christmas Eve, and gifts from Santa on Christmas morning. Even though my kids have outgrown Santa, we still "play" the Santa game. My dear neighbors, Jeff and Noreen lend me their garage door opener during the month of December, and let me hide the kids' presents in there until they go to bed on Christmas Eve. The kids know where I hide their gifts but have never spoiled their surprise! 22. Most annoying thing about this time of year? Ummm ... where do I begin?! Additional note: my all-time favorite thing about Christmas is the Christmas cards, photos and letters I receive from family and friends in the mail. Going to the mailbox is the highlight of every day in December! MERRY CHRISTMAS ONE AND ALL!! Feel free to consider yourself tagged! I am the proud owner of a NANCY MORGAN ORIGINAL !!!!! I received this gorgeous RAK in the mail yesterday from Nancy and was doin' the happy dance all the way back from the mailbox! Nancy is one of my FAVORITE stamping artists! Her work is everything I WANT mine to be! I receive my daily dose of inspiration from her blog, Paper Smiles. Not only that, but Nancy has become a dear cyberspace friend! Nancy is also known as ncmorgan on SCS. You can find all the details for this beauty HERE. Be sure to check out Nancy's Grand Opening Blog Challenges held each week in the month of November! My friend, Linda Wiest came over the other day. Together, we designed her Christmas Card. She came with a sample in hand (so impressive! ), and we modified the design to accommodate her family photo and the use of Stampin' Up! 's Dashing Designer Paper. Oh, it's gonna be so-o-o cute! Linda came bearing a gift for me! ... This super cute box filled with a mixture of Candy Corn and Nuts! I had never tried this combination ... I will never eat Candy Corn without Nuts again! Yummy! First of all, thank you for all your comforting words in response to our family's loss of my Uncle Rene. I am continually amazed at the outpouring of kindness I receive from my readers and blogging/stampin' friends! God Bless You All !!! How many projects do you offer at your classes and what do you charge? I normally offer five projects and charge $15. Have you every done a Stamp A Stack class? I've never tried this style of class before, but may have to try it someday! How many people attend your classes? The number varies. I am able to accommodate 16 guests at each session. I hold a morning session and an evening session in the same day. I normally have 5-10 class participants in the morning session, and 9-16 in the evening session. Do you offer a class by mail option? As of now, no I don't. I don't even know if Stampin' Up! allows that ... I'll have to look into it. I did call Stampin' Up! last week to clarify some questions I had regarding the changes in the Angel Policy. I was told we cannot sell KITS online, but we CAN sell completely finished projects. When selling completely finished projects, we must be very careful about the wording ...... you can say, "This is a hand stamped card using Stampin' Up! products." ... you CAN'T say, "This is a Stampin' Up! card". Why do you use baby wipes to clean stamps at your classes instead of Stampin' Mist Cleaner and Stampin' Scrub? I love to use the Stampin' Mist Cleaner and Stampin' Scrub when I stamp. The reason I use baby wipes for cleaning stamps at class is the cost. I am unable to purchase 8 Stampin' Scrubs and who knows how many Stampin' Mist Cleaner refills to accommodate that many people on a monthly basis. Baby wipes is definitely the most affordable option for my classes. Do you recycle the clear plastic bags that each projects comes in? Yes, most definitely! What are Stickles? Stickles is a non-SU product, and is similar to glitter glue, but specially made for paper crafting. They are acid free and non-toxic, non-settling, with an easy flow tip. I found them at my local scrapbook store. How do you handle using non-SU products in your class? Anyone who has attended my classes or been in my craft room KNOWS that Stampin' Up! products are numero uno in my book! I don't own one single non-SU stamp, and own very few non-SU products. (OK ... I take that back ... I do own ONE non-SU stamp ... it has a clarinet on it ... my daughter plays the clarinet in the band, and needed it for a particular project)! From the looks of my November Stamp Class projects, I can see how one might think otherwise since I used a Cuttlebug Dry Embossed background on one card, and Stickles on two cards. It is rare that I use that many non-SU products at my classes. I think my customers would all agree that I am a total Stampin' Up! FREAK! Nothing can replace the quality of Stampin' Up! stamps and the coordinating color families! (Although I do wish Provo Craft would start paying me commission on the number of Cuttlebug machines and accessories I've sold for them! LOL!). Connie asked for suggestions on getting people to come to her classes. I have been so incredibly fortunate in that department. I have the most wonderful group of friends that are the biggest cheerleaders anyone could ask for! They are constantly pumping up my business and bringing new people to me! (you know who you are ... THANK YOU!!!). a) People love to receive handmade gifts and cards ... that is HUGE in getting people interested in stamping! Start giving your creations to people as gifts, i.e. kids' teachers, friends, family, etc. ... it's bound to stir up conversation! b) Start a blog! ... when I meet someone who says they're interested in attending one of my classes, my blog is an excellent source for them! With a click of a button, they can see my artwork, my class projects and more! I've also had local people stumble across my blog who e-mail me to come to classes! c) Don't be afraid to ask your current class participants to bring new friends to class ... offer them an incentive for doing so. I have some incentive stamps that I've packaged attractively. If someone brings a new person to class, they and the newbie each get a new stamp! d) Get creative! My daughter's band had a fundraising dinner and auction the other night. Each year, I donate a collection of handstamped cards as an auction item. This year, I took it a step further and gave away a certificate for a free class, along with a catalog, mini catalog, and other brochures. I got two new customers from that! I also set out a stack of my business cards .... hopefully, someone unexpected will call ! Do weekends or weekdays work best for scheduling classes? That's the great thing about having your own Stampin' Up! business! YOU get to work that around YOUR schedule! I am not consistent with the scheduling of my classes, because no week, or day for that matter, is the same at the Riley house! When scheduling my classes, I first work around MY family's schedule. I recently added the morning session because I had several class participants express the desire for one. Normally, my classes are held on a weekday/night. Do you send out flyers or e-mail with class information? Definitely e-mail ... it's FREE! Are your class participants always the same ones, or are you always trying to get new people to come to your classes? BOTH. Like I said earlier, my "regulars" are my biggest cheerleaders! My business has grown because of them (Tammy, Norene, Paula, Leah, Sandy, Karen, .......)! My business only grows by adding new class participants. Not only that, but it is personally rewarding to see someone new fall in love with stamping! For Stampin' Up! Demonstrators and anyone considering becoming a demonstrator, I thought I'd share how I prepare for my stamp classes. My methods are nothing fancy or earth-shattering, but thought someone out there might find something useful from this post. I usually hold a morning class and an evening class in the same day, and can accommodate up to 16 people at each session. I usually cut paper for 20-25 people, and offer five projects. That's alot of cutting and supplies that need to stay organized! 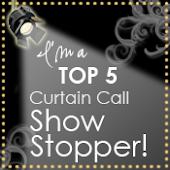 To see projects I've offered in past classes, click HERE. For me, sometimes choosing class projects is the most difficult part of the class preparation. But I find that once I start making a decision or two, the rest just happens! I do not re-invent the wheel by trying to design five projects on my own. I CASE most of my class projects and give credit to the original designer. 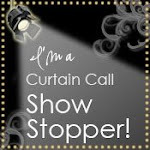 There are so many wonderful samples to choose from on other blogs (see my sidebar) and Splitcoaststampers.com (SCS). It's OK to CASE (Copy and Share/Steal Everything), as long as credit is given to the original designer! Each month, I make a new folder on my computer in My Photos, and call it "Possible November Class Projects" (or whatever month I'm working on). When I see something on another blog or SCS, I copy the photo to that folder, making note of where the photo came from. (In case I end up using that project, I want to be able to find where I originally saw it for a list of supplies, instructions, original designer, etc.). When I'm ready to get serious about choosing my projects, I have all the possible samples in one place in that photo folder. This process really helps me make decisions because I can see all the possibilities in one place. I often hear from other SU Demos about the complexity of my class projects. This is how I look at it: I have a hard time doing "simple". My customers come to my classes because they like what I do so that's what I offer for them. I want each and every one of them to go home with quality projects that will inspire them to create. I try to balance my style with do-able projects that up to 16 people can complete in 2 1/2 hours. Tools and supplies are a huge consideration when choosing class projects. I try not to duplicate too many tools, but luckily my sister-in-law Norene is very generous in lending her tools when I do duplicate! I love it when I find a project that uses a tool we've never used at class before! 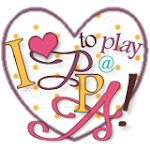 Another consideration when choosing class projects is the current Stampin' Up! Promotion. Notice how I used Designer Paper on most of my projects this month? I normally do use Designer Paper often, but really wanted to use a variety of it to coincide with this month's Paper Party Promotion. I also try to teach something new at each class, whether it be a new technique or introducing a new product or tool. I love it when my class participants' eyes light up over discovering something new! Of course, the obvious ... I use only CURRENTLY AVAILABLE Stampin' Up! products ... never retired stamp sets or products. I want to offer projects that participants can easily duplicate at home. I will occasionally use some general supplies available at your local craft store. These supplies are usually not the main supply of the project, and are simply a decorative addition. Once I've planned what my projects are going to be, I start doing lots of cutting! This card is a project I prepared for my classes last week. I am using it as an example for this post. I pre-cut six layers of CS/DP for this card. The smaller Very Vanilla and Purely Pomegranate pieces that you see in the next photo are for the inside sentiment. The clear plastic bag in the upper left hand corner of the photo is a 5" x 7 1/4" bag that I put all the pieces in for one project/for one person. This system works so well for my classes. Participants aren't spending time sorting through cut cardstock and trying to figure out what pieces they need. I got these clear plastic bags several years ago so I can't direct you to a supplier. I am sure they are readily available somewhere online or your local paper supply store. I do all the scoring of the CS for my participants too. I personally don't care for the fold and score method because of the non-professional look of the fold, so I pre-score all the cardstock for participants with my cutter and bone folder. For a tutorial on how to score with this method, click HERE. Also included in the clear plastic bag is a mailing envelope (class participants are encouraged to decorate their envelope however they like), and ribbon. This card project required the ribbon in two pieces; one to wrap around the center layer and the other to make the bow and adhere with glue dots. I always make sure to cut the ribbon piece for making a bow with extra length. You know how hard it is to tie a bow when the ribbon is too short! For small pieces like the Very Vanilla and Purely Pomegranate CS that dot the "j" and for the middle of the "o", I will lay several larger pieces of scraps out on the project table for participants to stamp on and punch out, or I will include scaps in the clear plastic bag. When it is a scrap piece that they will be punching out, I always snip a corner off with scissors so they know it's not a layer piece to the card. You don't want to cut these pieces too small or they'll be difficult to punch out. Once all the bags are assembled I put them in these inexpensive containers that I picked up at Walmart. All participants need to do when they sit down is grab a bag, and everything they need is at their fingertips and already sorted for them. Each container has one bag in the back labeled "EXTRAS". This bag holds extra papers, envelopes, ribbon, etc. that class participants can grab from if needed, instead of grabbing from an assembled bag. I make mistakes when I stamp, and I know class participants do too. I want everyone to have an opportunity to create a quality project, so using a second or third piece of paper is no big deal at my house! When I'm working on a class project, I create a recipe for it listing all the needed supplies, i.e. Stamp Sets, Paper, Ink, Embellishments, Tools, Supplies, etc. This recipe is especially helpful to me to double check myself when setting up the project on class day, and I can easily copy and paste it when I post the projects on my blog. Since I am only one person with up to 16 people at my classes and want everyone to make quality projects, I offer helpful hints underneath the recipe. These include hints that I would like to tell everyone verbally, but can't be at four tables at once. In the helpful hints, I might clarify which stamped image gets punched with which size of circle punch, what adhesive to use where, etc. Class participants are encouraged to read the helpful hints before starting the projects. This tent is simply a bright piece of cardstock, scored in half, with the recipe and helpful hints mounted on it. I used a bright color so it can be easily found on the table among all the supplies. Once all the paper is cut, the bags are assembled, and the recipe and helpful hints are typed up, EVERYTHING (punches, CS, stamps, adhesives, etc.) needed to complete the project goes in a container like the one shown in this photo. Again, they are inexpensive containers from Walmart. I like to set the entire stamp set out on the table for class participants to SEE. Sometimes, there's a card that requires several large stamp sets, and I want to make the stamps they need to use for that project easily accessible. In this case, I'll put only the stamps they need in a small container on the table, with the remaining stamp sets and cases nearby in case they want to see what other stamps are in that set. Here are some other items I use at my classes that I can't live without. I have several of these trays (found them at a garage sale). They hold baby wipes for class participants to clean their stamps after they use them. I usually have one of these for every two people with several baby wipes set on them. I set out the baby wipes right before class time (or when my customers remind me! LOL!) so they are still moist when they go to clean their stamps. Another Walmart special !!! I bought these containers for 99 cents at Walmart last February, and they are perfect for garbage at each table! One more can't-live-without class item ... these large wooden clips. I have one for each class project. They hold the project up nicely for everyone at the table to see. If you've taught stamp classes before, you know that class participants need to grab the sample project several times to view closer. With these clips, participants tend to grab the clip instead of the card so your sample takes less of a beating, i.e. fingerprints, bent corners, etc. I purchased these large clips at Michael's about a year ago. I don't think Michael's carries them anymore, but you can find them HERE. One more thing I offer my class participants, but don't have a photo of ... a brown paper lunch sack. Participants write their name on the bag, and place their completed projects in the bag. When they go to leave class, there is no question as to who's project is who's. I have found that it is easier to move people than it is to move supplies, so in my classes class participants rotate from table to table. This is a photo of my family room where I move my furniture to the walls and set up two six-foot tables with four chairs each. Each table holds one project and all the tools and supplies to make that project. I also set out Stampin' Up! grid paper. I can't stamp without it, so why should my customers stamp without it? Of course, I reuse them over and over again. This is my kitchen table that serves as another project station. Last, but not least, this is my dining room table that hold two projects. I've had to modify how I prepare for my classes from time to time, but right now this is what is working for me and my class participants. I strive to make it an enjoyable stamping and papercrafting experience for them, in hopes that they will leave inspired and want to come back for another class. Remember to prepare materials and provide the necessary tools and supplies in the way you would want it prepared for you if you were attending the class. It is with a heavy heart that I write this post .... my Uncle Rene passed away this morning. For those of you that have been praying for him, I thank you, and ask that you keep his wife Connie, son Mark, daughter Dawn, and our entire family in your prayers. Rene was diagnosed with Brain Cancer last Spring, and lost his battle this morning. He was a man of deep faith, and I know that he is in Heaven with Jesus. This photo is of Allie and Drew with Rene in July. We were able to spend a few days with Rene and the entire family in Denver, Colorado to celebrate Mark & Holly's wedding. Our memories of that time with family will be cherished forever! Today, I held my Christmas Stamp Classes. Here are the projects we made, along with the recipes. Within the next couple of days, I'll be posting a tutorial on how I organize for my classes...be sure to check back! This card is a CASE of Chat Wszelaki's card HERE, (nitestamper on SCS). For more of Chat's artwork, visit her blog, Me, My Stamps, and I. I love this card, and here I go again complaining about the way River Rock photographs! It is much prettier IRL! The River Rock background piece is dry embossed with the Snowflake Cuttlebug Folder, and Gold Stickles (non-SU) were added to the snowflakes and to the "j" dot snowflake. I rarely use non-SU products, especially in my classes, but couldn't resist the bling that Stickles adds for the Holidays! This card is a variation of THIS CARD that I designed last month. Instead of stamping the Poinsettia from the Season of Joy stamp set, we used the 5-Petal Flower Punch to make it, along with three Old Olive Brads. Simply punch two Real Red flowers and one Old Olive flower, adhere together (staggered), and roll the petals around a pen for dimension. We stamped the star on top of the tree, cut out, adhered to top of tree, and added X-mas Red Stickles (non-SU) for bling. This box and bow were considered two seperate projects. You can find the TUTORIAL for the FIVE-IN-ONE TEMPLATE BOX by Beate Johns HERE, and the TUTORIAL for the PAPER BOW by Jessica Crawford HERE. We made this super easy holiday packaging using a variety of Stampin' Up! Double Sided Papers from the Wintergreen and Dashing Designer Series Paper Packs. I'll never purchase another bow at a store again!Don't forget ...... the November Stampin' Up! Special .... buy THREE DP Packs, get ONE FREE !!! This gift card holder is CASEd from Nancy Morgan's original HERE. Nancy is known as ncmorgan on SCS, and her blog is Paper Smiles. The snowman is colored in with markers and Blender Pen for the Wild Wasabi, then Dazzling Diamonds were added with a Two-Way Glue Pen.Walmart carries a gift card this season that matches the DP from the Winter Bright Simply Scrappin' Kit and the snowflakes from the Merry & Bright Stamp Set. I'm told that iTunes also has a cool gift card that coordinates well with this holder! Ink: Jet Black Staz-On, Real Red Classic. Coloring in Snowman -- Real Red, Pumpkin Pie, and Blush Blossom Markers and Blender Pen with Wild Wasabi Ink Pad. Note: Use Glue Dots to temporarily adhere gift card inside. I received this beautiful RAK from Allison Fillo, Stampin' When I Can. Allison's blog is so very unique ... not only does she display her beautiful artwork there and valuable stamping information, she is an incredible source for Blog Challenges, Blog Candy, Newly Discovered Blogs, Tutorials, Sketch Challenges, and more! I don't know HOW she does it, but she does it extremely well! If you have any items on your blog that fit in these categories, all you have to do is e-mail her and let her know, and she'll include it on her daily update! If you don't e-mail her, she'll more than likely find it anyway! LOL! Yep, she's THAT good! If you've tried the recipe for the Pumpkin Pie Bars HERE, and the clarification #1 HERE, do I ever owe you an apology! When I first posted this recipe, my friend Dawn Easton e-mailed me asking if the pumpkin was Pure Pumpkin or Pumpkin Pie Filling. I then called my friend, Lorri Heiling who I originally got this delicious recipe from to clarify. I didn't know it at the time, but Lorri thought I meant Pure Pumpkin, as in a cutting open a fresh pumpkin and scooping out the inside. I'm familiar with the Libby's store brand of pumpkin, and they carry Pure Pumpkin and Pumpkin Pie Filling, both in a can. So...... clarification #1 (HERE) is somewhat accurate, and somewhat not. Lorri and I both used the Libby's 100% Pure Pumpkin, and Dawn used Pumpkin Pie Filling while decreasing the amount of oil, and increasing the amount of pumpkin. Both of my sources say each version turned out fine, but the original recipe calls for Libby's 100% Pure Pumpkin. My apologies if anyone tried the recipe and it didn't turn out quite right. A VIDEO TO MAKE YOU SMILE !!!! 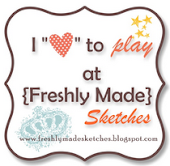 Hello my dear stampin' and blogging friends! My apologies for lack of posts. I've been super busy cutting paper for my upcoming classes, household chores, etc. 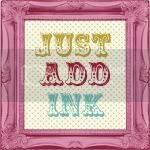 I have tried to do some "fun stamping" a couple of times and seem to have lost my stampin' mojo ... has anyone seen it?! LOL! I'm sure it's temporary, and it'll be back once I get my classes out of the way. Thanks for checking in ... if my mojo doesn't return before the weekend, I WILL have my class projects posted then (I like to keep my class projects a surprise for my local customers). I also plan to show you how I set up and organize my classes. This video will guarantee a smile on your face ... enjoy! CLICK HERE TO WATCH VIDEO. Have a GREAT stampin' week! One of my favorite stamping artists, Nancy Morgan, is hosting weekly challenges during the month of November on her blog, Paper Smiles, in celebration of it's Grand Opening. See the goodies she's giving away to the winner HERE. 3) Make a general card for someone "just because". 4) Actually give it or mail it to someone ... no more hoarding! Rule #1 was super easy ... that's what I do with ALL my cards! The "keeping it simple" was the biggest challenge for me. This layout was inspired by Sherri Barron's card on her blog, Fun To Stamp. I've mailed this off to my mom's cousin and his wife (Terry & Cheryl). They took my mom in last week when she experienced some health problems. I am so thankful they were there for my mom last week when I couldn't be due to my mom living in another state. Another Marching Band Season has flown by! It is bittersweet for our family, as we so enjoy the fellowship with the band kids and parents, and enjoy seeing Allie in her "element"! On the other hand, we will be enjoying the slower pace! Allie's band competed at the State Competition yesterday in Chandler, AZ, and received a rating of SUPERIOR! I'm so dang proud of these kids! This is a picture of Allie (2nd from the left) with her Senior Clarinet friends (Allie's a junior). She is going to miss them so much next year, and she's going to gasp when she sees I shared this photo on my blog! It was so-o-o hot yesterday, and this photo was taken after they performed. They are all hot and sweaty in their wool marching uniforms .... I think it was in the 90's yesterday? I never understood why Marching Bands are so popular in Arizona ... those wool uniforms are hardly ever appropriate for our weather! After the competition, we joined some of our band friends for vietnamese food at Cyclo in Chandler. WOW! I had never tried vietnamese food, and it was out-of-this-world delicious! If you're ever in Chandler, AZ, you've GOT to try it! Just be prepared for the owner's unusual humor! You can find Cyclo's website HERE. Dawn Easton e-mailed me with an excellent question about the Pumpkin Pie Bars in the previous post. Just want to claify that the Pumpkin is PUMPKIN PIE FILLING, not Pure Pumpkin. I changed the wording of the recipe in the previous post to make that clear. I'm still cranking out class projects so I don't have any new stamped creations to share right now. I'll be sharing my class projects with you next week. I also plan to show you how I organize class projects. I think Drew caught my flu bug ... he is home from school sick today. (I think he's just recovering from me beating him in a game of Scrabble last night! lol). This is the last week of marching band season for Allie with the state competition on Saturday. Monday night, they had a Parent March-Along. Our kids taught us how to march, stand at attention, march backwards, groucho marching, and more! After some rigorous basic training, the parents followed their child through the entire show. What a workout! ... and we weren't even playing an instrument or marching ... just running to keep up! I have always admired the kids for what they do, but now have a whole NEW appreciation! Great parent/child bonding time! I have another FABULOUS recipe to share with you today. My SU sideline, Lorri Heiling made these for our demonstrator meeting last week. They are INCREDIBLE !!!!! Stir first set of ingredients into moist mixture. Add 1 handful of chocolate chips. Pour into greased 9x13. Bake 350 degrees for 20 mn. Cool. Tracey Stam (aka racey on SCS) has a wall in her craft room that she is filling with cards from her favorite SCS stampers. I was included in that group! (*blushing* and honored!) I was happy to mail a card off to her ... my only request is that she mail one of her cards to me! This is the super cute card I received from Tracey. The flu bug is gone, and I'm feeling like my 'ol self again! Spent the day grocery shopping, cleaning house, putting Halloween decorations away, and getting Thanksgiving decorations out. I SHOULD have been stamping getting class projects ready (hitting it hard tomorrow!). Gee, it's usually the other way around ... I'm usually saying, "I should be cleaning, grocery shopping, etc. instead of stamping!". Another big surprise today ... I actually made dinner in advance in the crockpot instead of the 5:30 p.m. panic of "what the heck am I gonna make for dinner?"! Everyone is home tonight, and we can all actually sit down AT THE SAME time to eat a meal! Melt butter and pour over chicken in crock pot. Sprinkle dry dressing mix over chicken. Cover and cook on low for 4 hours. Blend soup and cream cheese; pour over chicken and stir to combine with butter and dressing mixture. Cook on low for 30-45 minutes. Serve over egg noodles. I haven't been posting regularly because I've been hit with the flu bug. YUK! Once I'm back to my 'ol self, I'll be focusing on getting class projects ready for my local customers. My apologies, in advance, for lack of new posts. I created this Star Box last week (inspired by Fran Sabad's star box HERE), using Wintergreen DP. I'm considering a version of this project for next week's class. You can find a tutorial for this Star Box HERE. I made mine shorter, measuring 4 3/4" tall.